Spring is time to make repairs to 3D targets. It is also time to start trimming the growth on the 3D range. Of course, before any of those chores started a little 3D practice was called for. Can this old coyote make it another year? If I can find some local 3D events in which to compete, I’ll not be following with the original 2019 3D plan. 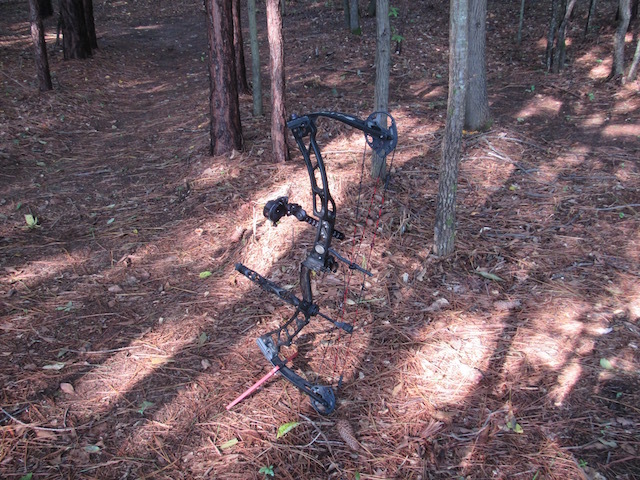 That plan was to use a bow set up for competing in the hunter class – pins and a short stabilizer. Unfortunately, the target bow I’d been shooting is a bust and the backup bow, used for 3D, is now the primary and only bow. Because there are easy to find outdoor target events that backup bow is now set up with long stabilizers, a sight and scope, and set for skinny arrows. Those skinny arrows will have to be the arrows used for 3D because I’m just not going to switch things around everyday to practice with skinny versus fat arrows. So, 3D will be solely for fun being at a slight handicap on arrow diameter. When I practiced 3D today the skinny arrows did miss a line or two leaving me with a 10 that might have been a 12 with a larger diameter arrow. It would have been nice to have two bows – well I did have two bows – that is two bows that performed well. You might think it is all me regarding the “nicer” bow that failed and is now banned from my range. But, after a solid year of saying to anyone that would listen that the bow wasn’t right I let the numbers do the talking. Keeping data on both bows revealed the backup bow out performed the ‘fancy’ bow when in my hands (7% better – 7% is a lot of points at 50 meters). For me, the backup bow is much better and that means one bow rather than two for the different archery disciplines. Even so, shooting on the 3D range is a nice break from flinging arrows at dots. It’s You Not the Bow! It’s you not the Bow! Well, we’ve all heard that one. Last year I bought a new bow specifically for USA Archery and NFAA target shooting. The old bow was fine. The old bow is a catchall advertised to be useful for hunting, 3D and target shooting. It is exactly as advertised. 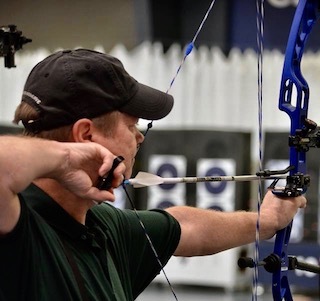 I was at a point where my groups were tight; I’d won a number of tournaments with the one-bow-does-it-all and felt it was time to invest in equipment that might yield a few more points. Specifically, a bow marketed exclusively for target shooting. This would mean a longer axil-to-axil for certain and perhaps a few other target specific alternations. I bought a highly recommended target bow, which according to the salesman, “All the top pros are shooting this bow.” I bought it. With the new bow I practiced and practiced. At each tournament, new bow in hand, I lost and lost. Notice the shotgun pattern formed with the newer bow. Now look at the three arrows that missed the target! I paused, took a bio-break, returned and the arrows all shot right. This is when I put the new target specific bow down and picked up the old bow, again. The groups would be rather tight then there’d be a flyer. The groups would widen and my scores would drop. I just could not figure out the problem. One day things would seem okay, the next arrows flying all over the place. In the middle of 2018, after losing in a major event where I was up 6 points going into the final six arrows I put the bow down. I loaded up the catchall bow, went to the next tournament and set a new State record. I figured it was a fluke. I grabbed the fancy target specific bow and started working with it, again. And again, I lost and lost. I took the new bow to my local archery shop and they checked it out, made some adjustment and returned it. 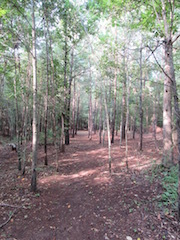 It shot well for a while – then arrows began landing in shotgun patterns. I emailed the manufacturer and explained what was happened. There was no response. Most notably, when shooting at increasing distance, the windage needed to be adjusted. Those adjustments were not slight. Arrows would land wider and wider as the distance increased. Oh, there was no wind and it was the same target. 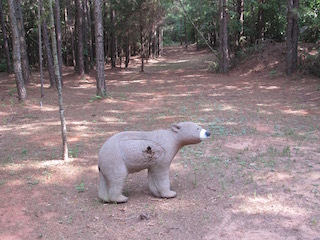 I’d shoot at 30 yards and work my way out to 70 yards adjusting the windage every ten yards. It felt like it wasn’t me and I began asking more questions. I even hired a coach to see if I’d gotten out of tune. When it came to the problem of shooting the new bow there were all manner of answers and voodoo remedy: “You have to bend your bow arm with this bow,” “You need to keep your bow arm straighter,” “ You bend your bow arm and keep it straight at the same time,” “Keep your bow arm and back really extra tight, “ “If you’re too tight you’ll shoot your arrows right with this bow,” “This bow likes to be closer to the thumb of your bow hand,” “You need a new string,” “The string has stretched, “ “It is a little out of tune,” ”Your peep rotates,” “You’re too short for this bow,” and finally, “Maybe you just shoot the other bow better.” No doubt about the last comment. But, the question is, why? The other older bow isn’t a true target bow. The flawed new bow is a true target bow. Working with bow techs every manner of adjustment was tried and tested. More weight, less weight, different release, different arrows, new angle on the front stabilizer, shorter rear stabilizer, etc. 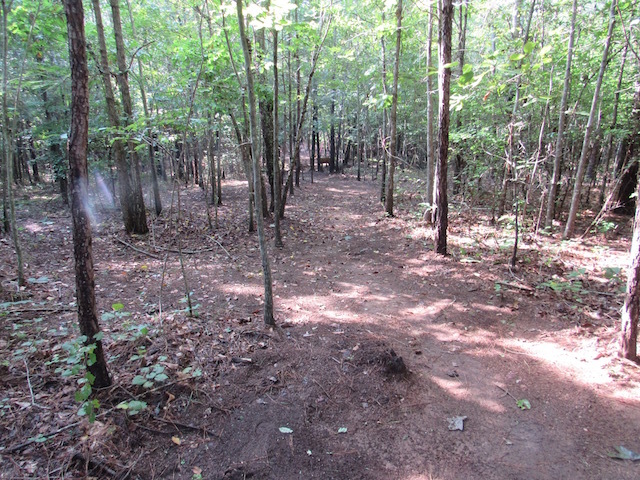 The course of less tight groups marched onward. The ‘flawed’ term is what I’ve determined. Over and over the new bow fails to shoot consistently. You’d automatically want to blame the archer. The archer gave the bow a solid year of practice and over that time scores diminished with the new bow, while scores increased with the old entry level catchall bow. Today, I shot 5% better with the catchall bow compared to the super target bow. The comparison was over two days. I went back to the data on the two bows. Looking back over two years I averaged 10 points higher at 50-meters with the one bow does it all. 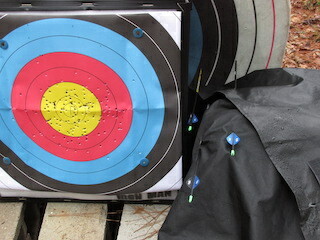 In a final test, I took the catchall bow to an indoor range and shot a 5-spot. Using the target bow I’d lost, taking second place, at the State NFAA 5-spot indoor championship missing the 5 three times. I’d wanted to go to Cincinnati and compete at the NFAA Nationals. In order to make the trip I set a minimum requirement for the State Championship. That goal was 600 points over two days and 96 Xs. I failed to reach that mark. 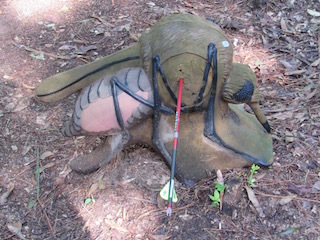 However, when testing the catchall bow, using skinny outdoor arrows, I shot a one-day total of 300 points and 52 Xs. That was the final straw. Yes, I know I need to get get my elbow around. This lands the arrow wide right. Even so, wide right is still in the white if not a 3 o’clock X.
I believe good equipment is paramount at a certain level of competition with any sport. I also believe, in archery, shoot the bow you shoot best. Needless to say, I am extremely disappointed in the bow purchased with the intent to improve my scores a little. That new bow didn’t pan out. No, in this case, it is the bow. But, the question why remains unanswered. 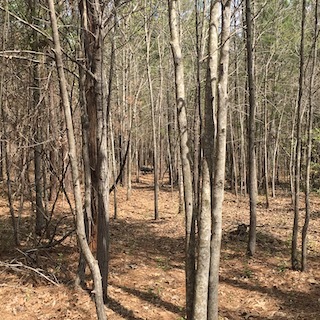 Author David LainPosted on March 15, 2019 March 15, 2019 Categories Archery, SportsTags EquipmentLeave a comment on It’s You Not the Bow! Last year I purchased a bow specifically for target shooting. During practices I’ve had some decent scores with the bow. In tournaments, it has been another story. 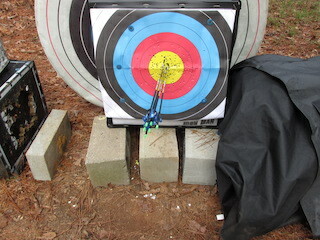 Yesterday, during practice, using the target bow, I wasn’t shooting badly. However, I wasn’t shooting what I felt was going to reach my average score. I stopped shooting, took the sight, scope, and stabilizers off the target bow and out it on my 3D bow. I’ve not shot the 3D bow too often since last year and it took a few ends to get the feel of it with the longer stabilizers. After practice I compared the scores. 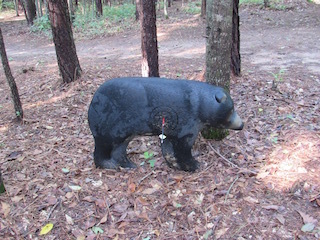 The non-target bow ended up scoring 5 points higher. While that might not be statistically significant, it could be extremely important in an archery tournament. I’ve lost more tournaments by a point than I care to think about. Heck, I’ve lost three with the same points as the winner. Twice I had the same X-count as the winner as well. Of those, I ended up losing by a one by a single arrow closest to the center shoot off. Another time I lost to the inner X count, and once to a one-arrow X margin. Those were hard loses. Thus far, in tournaments, I’ve never set a personal best. In other sports competition is where all my personal bests were established. Adrenaline may help in running or cycling, but it isn’t a friend to the archer. In archery, anything than can help to reduce excitement and calm the performer can be a benefit. Maybe going with a different bow that feels a little trustworthier will help over the next two days. I suppose I know pretty soon. A few weeks ago I increased my 30 arrows, inner ring X, goal to reach an average of 295.I’d been pretty steady at 290 and felt it was time to most up a bit. In practice, I warm-up with 6 to 12 arrows, shoot 30 and record the score, pause, then shoot another 30 when I’m preparing for indoor 18-meter events. I repeat this practice during the afternoon. Along the way I may change the focus of the practice. Some days I shoot for timing, other days I spend looking for improvements in form, there are times I change releases from a thumb to a hinge. Throughout it all I record how I did on each arrow minus the warm-up. A 295 for 30 is half of the total count for a 60-arrow competition, or a final score of 590. I’d managed the 580 – 588 range, a 290+ thirty arrow score, enough times that it was clearly time to move the goal. Then, things began to fall apart. Obviously, the primary consideration is the archer. After about a week I took a look at the equipment. 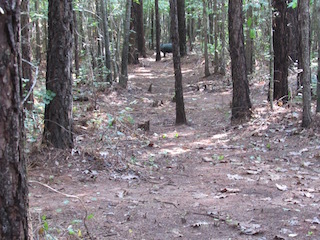 That’s where I discovered that my 60-pound max bow was firing arrows at 46 pounds. Corrections ensued and the scores remained lower that the prior 290 thirty arrow goal. The cause seemed to be the archer. The scores were better but still below the earlier average. Paper tears where shot, adjustments taken and repeated. Arrows finally flew straight, but I could not get comfortable. The first few arrows would be fine then shots began to drift. 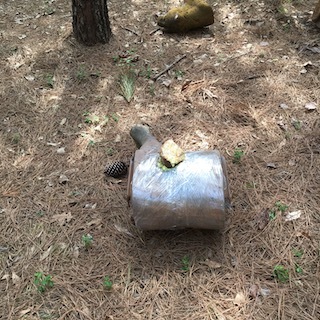 Once again, the poundage was checked and this time measured around 58 pounds. For me, that is too high. A turn was taken off the limbs and the score drifted up a little. 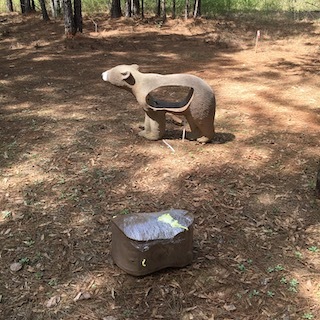 In 25-meter tournament last weekend I shot the first 30 better than the second, a revise of how I typically perform. Today, once again, arrow placement started off good then drifted. My data shows that I shoot best at 50 pounds. So, I took another crank of the limb screw for my second 30 arrows this morning. The bow immediately felt better. The arrows immediately grouped tighter and the score improved by 9 points. Still below average. When I bought this bow a few months ago my gut told me not to purchase a 60 pound bow and rely or cranking the limbs out to achieve the maximum variance allowed for the bow at 50 pounds. It has been a matter of tinkering to keep the bow at a steady poundage. In an all out rehab, the bow, less than one year old, was restrung, timing adjusted, poundage checked, and paper tears verified. The the rear stabilizer was replaced moving from a 15-inch to a 12-inch and the bow was balanced. I haven’t given up on the new bow, yet. Well, it is the bow. There seemed to be something off during my last competition. In fact, my arrow placement has been dropping. It was so bad during last week’s tournament I shot two eights at 18 meters.The last tournament was scored with the inner ten equaling 11 points. Despite a recent slump I was optimistic. Before long it was apparent something was clearly amuck. Things started pretty good but didn’t last. Before I’d shot nine arrows I knew the monkey was on my back. My arrows were flying all over the place. My first thought was that I’d hit rock bottom. My second thought was that something was wrong with my equipment. The equipment should be fine. It had been checked out in the previous week. Still, when I got home I took my stabilizers and scope off my Elite Victory X and put them on my Elite Energy 35. Low and behold – the arrows were landing more or less where I wanted them to land. The arrows are Easton 2018s. The Victory X is a 60lb bow set up for around 54 lbs. The Elite Energy is a 50 lbs. bow giving me 52 lbs. I’d shot 2014s with the bows in the past and moved over to a stiffer arrow few weeks ago. With the Victory things had been looking good. Then, things didn’t look so good. At last year’s Georgia 50 meter State Championship, I was training with the Victory. Prior to the Championship I went back to the Energy and won the event setting a new State record. I did the same for the next outdoor tournament and again set a new record* using the Energy. When shooting the Victory the arrows just seem to shift. I’d have to adjust windage when there was no wind. Following that I took the Victory to the local bow shop where I’d purchased the bow explaining that something seemed off with the bow. I also contacted Elite looking for help. Elite didn’t respond. Indeed, the limbs had somehow loosened and one was no longer matching the other. Corrections were taken and the bow performed well. Well, for a short while. 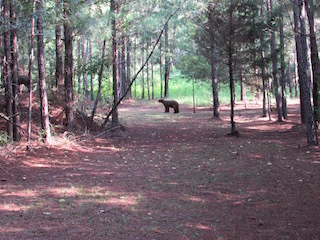 This latest problem was soon chased back to the bow. The Victory, set at 54 lbs. was tested and found to have a draw weight of 46 lbs. Forty-six pounds from a bow that has a maximum draw weight of 60 is seriously out of whack. At the Indoor Nationals last year (the tournament for which I’d bought the bow) during bow check in I discovered the bow had dropped the poundage. I’d assumed it was a variance between measuring devices. The Victory X is a nice bow. Mine is nine months and 5 days old. I shoot about 100 arrows a day on average. My Victory X seems to have some issue with staying tight. The recent discovered change in draw weight isn’t the first time – it is now the third. The first, I blamed it on variance of measuring devices. The second time, well no fault was assigned. This third time, well it is the bow. The third time is also the charm. Today, while practicing, I had to pause and tighten the locking screws that are on the sides of the limb pockets. At this point I have no idea why this bow gets loose. But, I do hope it can hold together long enough to compete this weekend. *Unofficial record. No higher score can be found online and I have contacted the State officials to verify – they’ve not yet responded. 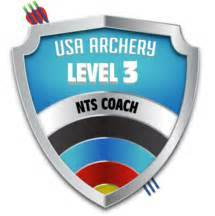 Author David LainPosted on December 6, 2018 December 6, 2018 Categories Archery, Archery CompetitionsTags 18 Meter Indoor, Equipment, SportsLeave a comment on Well, it is the bow. It has just been four years, nine months and one day since I picked up a bow. Over that time I’ve shot a lot of targets. Of the sponsorship that would be nice a manufacturer that makes 3D animals would be good. At 3D tournaments I typically get handed my lunch. Sure I win some of them. Mostly I don’t win. It isn’t because I don’t practice. In 3D there is the practice associated with shooting and the practice associated with judging yardage. Where I get hosed is judging yardage. It is typically the ups and downs that score me an eight. When I’ve shot known yardage, well that’s another matter. Three years ago it became clear that having a 3D range would be beneficial. So, I began putting together a foam menagerie. Most of my targets are on the small side. The big targets are bigger in price, hence the small targets. Heck, even paper targets are pricey. Say a paper 3-spot is around a buck. Go through 40 of them in a month and you’ve shot away some cash. My recent package of twenty 3-spots from order off of Amazon cost $13.99, which was a pretty good deal. Either style, foam or paper, targets are’t cheap. My targets stay outside year around. There are covers you can purchase to protect 3D targets from the elements. My poor critters are naked to the elements. 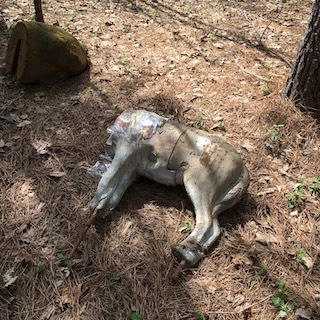 Over time the poor 3D animals are taken a toll. A few of my faux-animals have been amateurishly repaired more than once. Many now need more corrective surgery. I suppose I could order a new core. Maybe filling this hole with a commercial foam will buy me some more time. Yes, a bow sponsor that lavished their latest and greatest on me would be nice. But, free 3D targets would be better. Two points is the difference between shooting my Black Eagle Challenger arrows and Carbon Express arrows. One point can be the difference between first place and second in a 3D tournament. At this weekend’s upcoming ASA Georgia State 3D Championship; I’ll not be able to fire off my Black Eagle arrows. I’ve got plenty of the Black Eagle arrows. Some are only the shafts; others have busted nocks and ripped vanes. Two weeks ago I dropped off seven of these arrows or shafts to have them readied for the upcoming shoot and ordered a package of extra nocks. I kept five for practice while I traveled. By the time I finished my travel those five Black Eagles that made the trip didn’t completely survive the practices. None of the shafts got busted but I lost three nocks and the vane off of one of the other arrows. That left me one intact arrow. No problem, I had seven more to pick up that should have been perfect. Those arrows along with a package of extra nocks would me sitting just right. When I arrived at the shop to pick up my arrows is where I learned they weren’t ready. They were also not going to be ready before I left town for the 3D championship. The Carbon Express arrows are old. I bought them three years ago in Pittsburgh. I’d had a dozen and have eight remaining. They’d have to work. The Carbon Express is not fat (23) like the Black Eagle. Typically, I don’t get too many line cutters. The arrow is either on or off the mark. Still, I’ll end up getting a few extra points thanks to a wider diameter arrow. Yesterday, in practice, there was one shot where a slightly wider arrow would have made a two-point difference. I guess I’ll need to be on this weekend. A couple of months ago, I decided it was time to purchase a target bow. 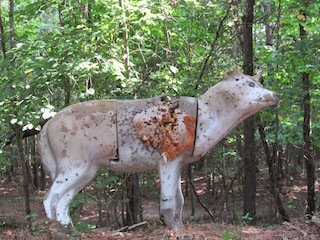 I’d been shooting an Elite 35, a one size fits all bow when it comes to 3D, target, and hunting. What I felt like I needed was a longer axle-to-axle length for target competition. There are a number of bows that fit the axle-to-axle requirements I thought I needed. There are three I was interested in trying and buying one of them. After my due diligence into the bows I labeled them A, B and C based on the order they’d finished in my review. The final decision would be based on price. For me price is a major consideration. I am retired and live on a fixed income. I have a budget and that does allow for purchases like a new bow. Still, I am not going to spend money where I don’t need to spend money. The ‘A’ bow was the second most expensive. The bow that was selected, a nice bow even if it is not the manufacturer’s top of the line, was chosen based on, among other things, price. I am not a bow manufacturer’s “Pro” staff member. Being on someone’s “Pro” staff could mean a discounted or free bow. I’m a “Full Price” archer when it comes to bows. It turns out, I might not have had to have been a “Full Price” bow customer when it came to this recent acquisition. .
At a social event I ran into a friend that happens to be a bow manufacturer’s regional representative. He’s a very pleasant man that I’d met years before he was working for a bow company. During our conservation I mentioned I’d ended up selecting a new bow based on it meeting my specifications and price. It was not one of his company’s products (The ‘A’ bow). I added that the acquired bow has a twitch in that for me any slight bow arm error pulls my shots to the left. Not by much and certainly how insurmountable, it’s just an issue I’ve not had to the same degree with different bow. To my surprise, he seemed surprised that I’d not mentioned I was considering his bow to the staff at the shop where I’d made my selection. He added he’d have gotten me the ‘A’ bow though the shop bow program. Indeed, I had mentioned the bow and shot a demo of the ‘A’ bow there at the shop where I made the eventual purchase. His bow was just to pricey. Well, needless to say, I was disappointed. Whether or not the unattained bow might have brought me an extra point or two during the recent tournament I cannot say. What I looking for with equipment upgrades is a point or two. What I can say is I remain a “Full Price” archer when it comes to bows.